This is even nicer than I expected. Great craftsmanship. It actually has quilting stitches. I expected that to be more of a printed pattern. I have bought the full/queen for a queen size mattress. I always worry that would be small for a queen. It covers just below the bottom of the mattress, so a bed skirt is a must, but it looks great. I would definitely purchase this again and highly recommend. The Truly Soft brand is all about comfort and durability. The Buffalo Plaid Quilt Set is perfect for year round use and super soft. Available in multiple colorways. Plaid print provides a casual look. Brushed microfiber shell for softness. Easy care. Machine washable. Imported. I bought the quilt set for my son's big boy room. It's very soft and well made. I took away a star, however, because the size I ordered, extra long twin, is definitely not extra long. It actually works out better for us. I only needed a regular length twin, but that size wasn't available. However, if you actually had an extra long bed, the quilt would be too short. Arrived quickly. We ordered the tan / white and the colors are perfect. Very soft to the touch. Good quality. Shams are nice style. Would recommend. 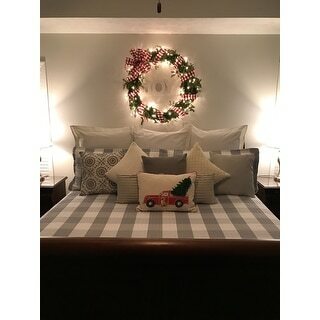 Buffalo plaid is all the rage and this quilt set was perfect for my bedroom. Can stand alone with solid sheet set or smaller coordinating print. 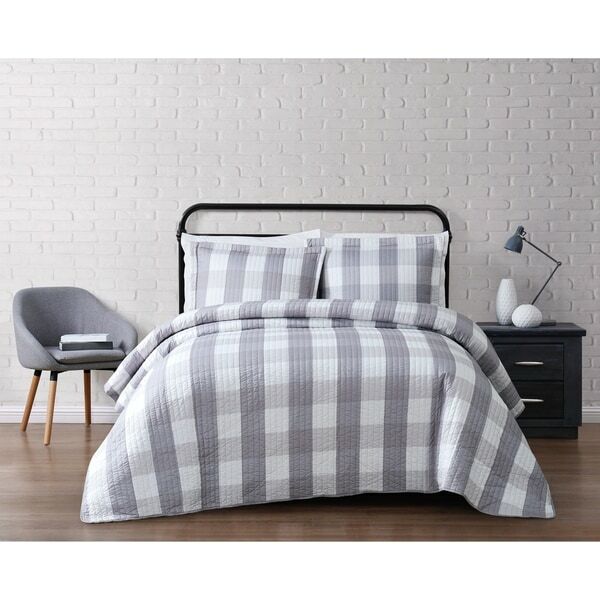 Flannel sheets with the set makes it great for winter too. Thanks Overstock! I was very disappointed in the quality and the color of this quilt. The fabric was slick feeling and too light. It reminded me of the bedspreads they use in cheap motels. Also, instead of being a light grey, the buffalo check print turned out to be more of a purple-grey. The reverse side of the quilt WAS a true grey and closer to the color I was expecting, but it was a completely different color than the printed side. And then I got charged *** to return it. Not happy at all! Exactly what I wanted! Soft grey color, soft texture quilt, and a great price! Looks amazing in my country home! I would definitely recommend it to a friend. Absolutely love this quilt. Arrived quickly after ordering. Color and size as expected. Well made. Would recommend this quilt to others. Wonderful buffalo plaid colors and just the right weight for a South Florida bed. I ordered two sets in the white and tan for my elderly parents for their beds at the nursing home they are in. I absolutely love them! They are a very nice weight and are perfect for their beds. I love the buffalo check! I love it, looks so cute in my bedroom, soft, nice quality for the price. "I have a queen size bed and is kind of a high bed. None of the queen size quilts/comforters fit. They are just too small , should I be ordering a king size? I want my bed to look nice when it's made up." I have the same problem. I always order a king-size comforter/duvet for our bed. Our mattresses sits high as well and a queen/full will never cover all of the bottom box spring. The king is large though, but it allows for no skirt.